A breakfast treat that all will enjoy, these apple cinnamon oatmeal pancakes will fill you up while the bananas and apples will provide a natural source of sugar. If you follow me on Instagram or read my blog regularly, you’ve probably noticed how much I love smoothies and oatmeal. In fact, they are my go-to breakfast most days of the week. But every now and then I crave a hearty stack of warm pancakes. Who doesn’t? 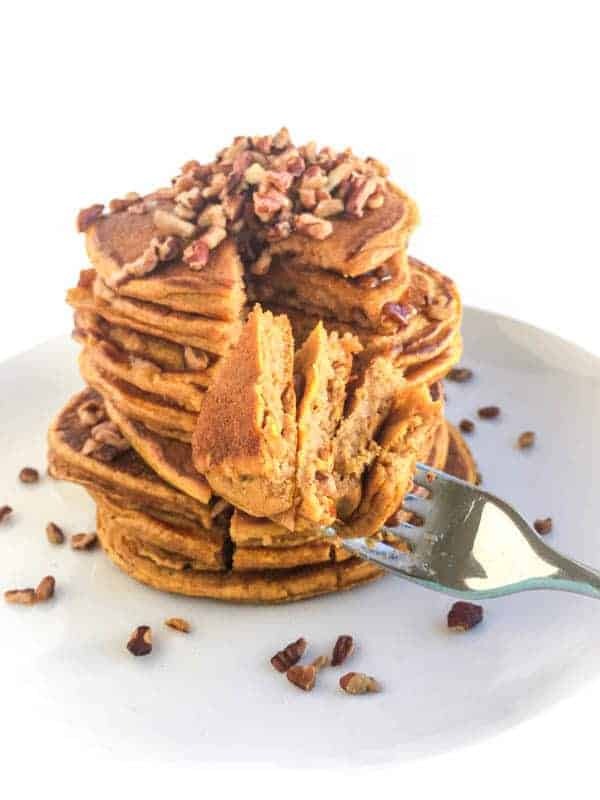 These apple cinnamon oatmeal protein pancakes contain no white or brown sugars and do a good job of keeping you full all day. 1/4 cup protein powder vanilla is great! Heat griddle or non-stick saute pan over medium-high heat. Spray with non-stick spray once hot. Pour pancakes on to griddle, 1/4 cup at a time, and cook until first side is browned - about 2-3 minutes. Flip and cook additional 2-3 minutes or until second side is browned. Continue working in batches until all of the pancake batter is gone. I found your website while looking for a recipe for protein packed pancakes. I just tried the Apple Cinnamon Oatmeal Protein Pancakes. Wow! Great recipe! And it made my house smell so good! Thank you much for sharing it! I’m so glad I came across your website! The recipes you share look so simple and full of fresh ingredients. I tried the Shish Tawook Chicken and the Lebanese Hummus with Toasted Pine Nuts last night. Both were a hit with my family and me! The best Hummus recipe I’ve ever made! Thank you! Looks fantastic, but I don’t use protein powders (I use hemp seeds in smoothies for extra protein.) Any suggestions for what to sub for the protein powder? Coconut flour maybe? Thanks!! I’m hoping my 14 year old son will like these for breakfast. He’s not hungry in the morning and it’s hard to get something healthy into him on school mornings at 7 a.m.
Coconut flour should work!! Let me know if you try it!! Enjoy! But you don’t state how much – a scoop is not a measurement. Hi Nicole – Sorry about that! I just edited the recipe to include the measurement. This sounds awesome! I’m going to try it this weekend. What kind of apples did you use..Granny Smith or red apples? Oh my heaven, can you come over and make these for me this morning? I wish we were eating them together!! Yay! I love protein pancakes. :) And apple cinnamon? That can only make things better! Love the ingredient list for these. These are so good!!! Let me know if you try them!!! I’ve seen these before?! And haven’t made them yet?! Oh wait. I know what it was. Apples in February does not compute in my head. I’m totally making these in a week or two! These were wonderful! Such great flavor. Thank you so much. My husband even loved them. Thank you so much for letting me know! I’m so glad to hear!!! Liz, Thanks so much for this delicious recipe. Just made these for breakfast this morning after seeing on pinterest last night. Aaamazing! SO glad to hear!! Keep me posted if you try anything else! Great pancakes. Gluten free! Can also substitute soy flour for the protein powder and, surprisingly, grated carrots for the apple to further reduce simple sugars. Some Real Fruit spread or honey instead of the corn syrup we are all trying to avoid – sort of. We adore pancakes in this house, and often beef them up with healthy ingredients to make them enjoyable but also better for our bodies. 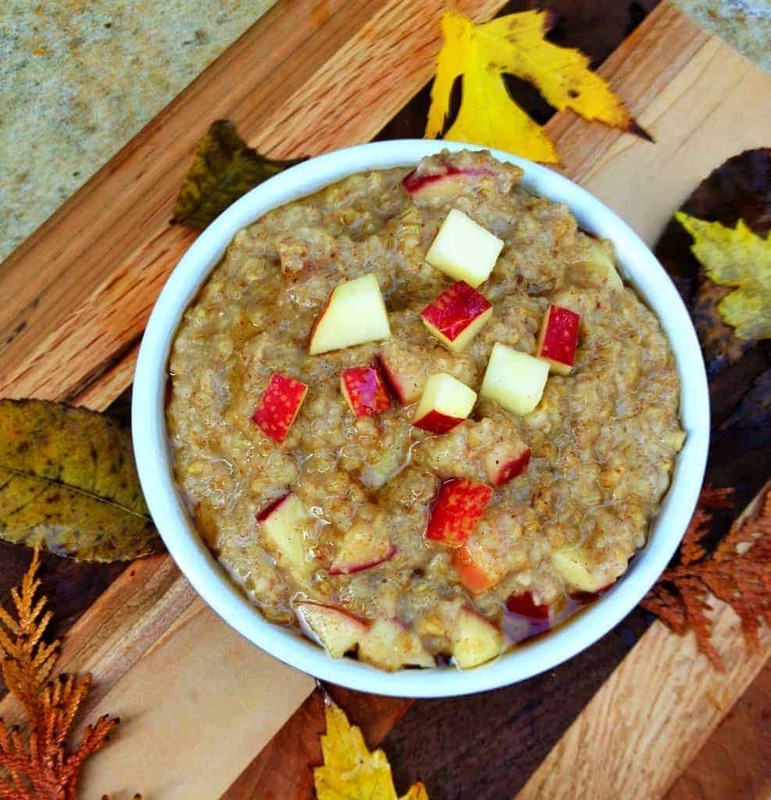 Apple, cinnamon and oatmeal is one of my regular breakfasts, so what a great idea to turn it into a treat! We made these today and they are amazing!! Easy, tasty and very filling. These were a bit tricky to keep from falling apart on me but I loved the taste! Oh AND I sauteed half an apple with a little cinnamon and honey while these cooked for a topper! Delish! Pancakes are always a little tricky for me too! I often have to have the heat lower than I want to keep it. Glad you liked them!! wow, these look great! :) So healthy and tasty! Thanks so much Addie!! They are really good and filling. Im reading this as I’m getting ready to whip up an oatmeal, apple, pb smoothie for breakfast :-) These pancake look super yum! I’ve never tried adding protein powder to my pancakes, but definitely want to try this recipe. P.S. Maple Syrup is never “optional” in my house~it’s a must! 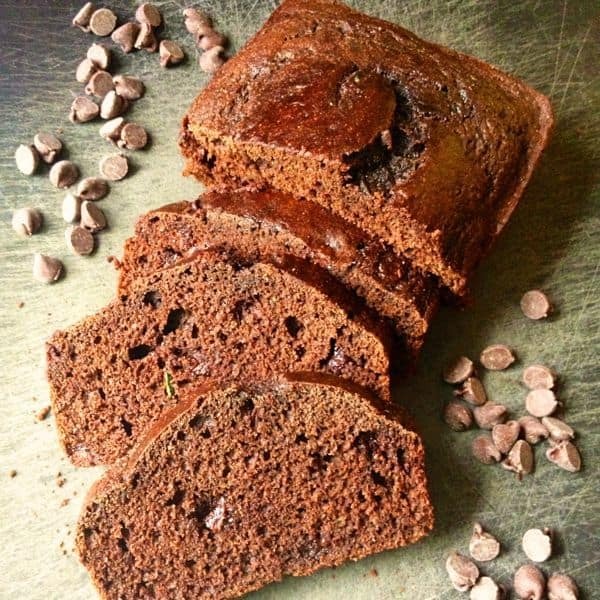 These were amazing, I didn’t have flax seed so I added in a couple table spoons of sun flowers seeds for some added texture. Yummmmm!! Thanks for a great breakfast food! Wow what a great idea, Cari!! I bet they turned out great with the sun flower seeds! Hel-lo!!! These are so me! You need to make these!! So good!! This is a great recipe, Liz. I can’t really do the oats like that in high quantity but I can see my kids loving these! These sound like the perfect thing to make a big batch of and freeze. Easy, healthy weekday breakfast! It’s so funny you mention that – I have plans this weekend to do just that!! Every week day I wish I had them in the freezer!! I started grating apples a lot because my 16 month old can’t quite chew apple chunks yet. We do it in oatmeal a lot too! Have a great weekend Amanda! I just want to eat pancakes all the time. Love the idea of fruit mixed in to make them healthier! Definitely trying these with my son! I think I may have done the happy dance! I love, love, love pancakes! But I don’t make them as much because they “used” to be unhealthy. Now, I’m going to get my pancake making on, for sure! I’m the same way – I had stopped making them for awhile for that very reason but I’m really learning that there are so many great ways to create healthy pancakes. Enjoy Lauren! I am an oatmeal lover too, so these definitely catch my eye…. and just in time to make tomorrow for a lazy Saturday morning treat! Happy Weekend!!! I knew they were a hit when my husband and 16 month old both cleared their plates. The apples really add a lot of great moisture and flavor. Enjoy!! Such a great pancake recipe, Liz! Thanks so much Robyn. Happy Friday!! Yep, these are my kind of pancakes (apparently, we both had pancakes on the brain today). I love that you used grated apple in these for flavor and moisture. Too funny Dara!! Yes I started grating apple a lot for my little one who can’t quite chew apples yet. We do it in oatmeal all the time. :-) Happy Friday! Yes – these are PERFECT post workout!! Very filling. Enjoy Carrie!